The Huntsville, Alabama Parapsychology Study Group is being offered a very rare opportunity to host Author, Lecturer, and Researcher, Lloyd Pye for our Oct. 29th 2010 meeting at Unity Church on the Mountain on Governor’s Drive. 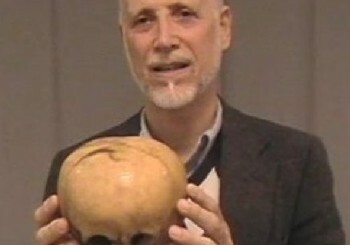 In the late 1990s, Lloyd Pye obtained a curiously shaped human child’s skull from a couple in El Paso, Texas. The skull was reportedly found in a mine tunnel in northern Mexico, buried beside a skeleton of a morphologically typical human female adult lying exposed on the floor of the mine tunnel. The unusual skull has an enlarged though symmetrical cranium, and while it contains most of the complement of normal human bones, they are greatly distorted in shape, as for instance it is without an external occipital protuberance. Carbon 14 dating shows that the skull is 900 years old + or – 40 years. Pye proposes that the abnormal skull is the product of a human/alien crossbreeding program. He refers to this being as a “Starchild” and the skull as the “Starchild skull”. Pye has subsequently arranged for funding and scientific testing in an attempt to demonstrate that the skull’s genetic heritage is extraterrestrial. In his non-fiction books, Pye focuses on Cryptozoology, especially hominoid cryptids such as Bigfoot and Yeti. In his book Everything You Know Is Wrong he claims that these animals are Earth’s only indigenous bipedal primates, and that early hominids such as Neanderthals and Australopithecines are not the only intermediates in human evolution. From this premise, Pye claims that early hominids could not have been the ancestors of modern humans, denying the established scientific consensus supporting common descent. Combining his ideas with those of ancient astronaut believer Zecharia Sitchin, he proposes that deliberate genetic manipulation of existing homonid populations by alien beings produced Cro-Magnon, or modern-day, man. Pye, by means of accepting Stichin’s ideas, proposes that the first modern human peoples were the ancient Sumerians, whom Stichin claims had knowledge of aspects of modern astronomy such as the existence of Neptune, Uranus, and Pluto. Lloyd Pye is an American author who is famous for advocating an ancient astronaut proposal for the origin of human life by deliberate intervention by extraterrestrial life. He is the author of four books, including “Everything You Know Is Wrong” – Book One: Human Origins. He also gives lectures and television appearances in support of his ideas on The Learning Channel, National Geographic Channel, Extra, Animal Planet, and The UKs Richard & Judy Show. I’ll be posting a review of this lecture and interview with Lloyd Pye about the StarChild Skull and report some new information concerning his research and future plans for 2011. After a month long campaign to convince Lloyd to graciously visit the Huntsville Parapsychology Study Group I found his work to be extremely fascinating and grounded in scientic fact. His dedication to solving the origins of the StartChild Skull is evident in his passionate lectures and private conversations about his need to decode the genetic DNA. Privately and publically he’s responded to his critics and answered all of the major questions to remove any doubt that he’s very serious about his work and has objectively sought to bring the truth forward. It’s only a matter of time before we have those answers and while Lloyd has circled the globe to share his revelations concerning the skull, he’s making many friends that believe and support his work. His tireless work has covered a span of over a dozen years and he’s now very close to doing the hard science that is needed to decode some of the DNA. Once he completes this cycle of knowledge and brings it into the scientific community, our world will never be the same..
1. Its bone is half as thick as it should be and it weighs half as much. 2. Its bone is two-to-three times more durable than it should be. 3. That durability is due to three absolutely unique physical characteristics. (a) Its chemical makeup is more like tooth enamel than normal human bone. (b) It contains much more collagen than is found in normal human bone. (c) Durable fibers are somehow woven throughout the bone’s matrix. (d) These fibers are unknown in any other species on earth. 4. A red residue found in its cancellous holes is not found in any other species. 5. Its eye sockets are utterly unlike the eye sockets of normal humans. 6. It has no trace of frontal sinuses; humans always have at least vestiges of them. 7. It has a “crease” along its saggital suture that is not found in normal humans. 8. It does not have the brow ridge that is found in all other higher primates. 9. It has no “dip” downward from its missing brow ridge to form its nose. 10. Its inner ears are at least twice the size of normal human inner ears. 11. It does not have the inion that is found in all other primates on earth. 12. Its neck is oval-shaped and half the size and volume of a normal human neck. 13. Its foramen magnum opening is shifted well forward from normal humans. 14. Its balance point is centered under its physical mass while humans are off-center. 15. Its chewing muscles cover only half of the surface area of a normal human. 16. Its brain is fully 1/3 larger and thus heavier than it should be for its cranial size. 17 Gravity should have squeezed its oversized brain out of the foramen magnum. (a) A lack of any such squeezing indicates its brain was made of denser material. 18 The lacuna pits scattered across the surface of its bone are completely missing. 19. Its maxilla held mature teeth and impacted teeth, which humans do not have. 20. The roof of its extremely small mouth was flat rather than arched. In Malta I was with a great group of speakers that included Colin Andrews, Marcia Schafer, Steve Bassett, Phil Gruber, Geoff Stray, and Adriano Forgione, who publishes some of the finest alternative/UFO magazines in the world if you can read Italian. Adriano has created something fascinating with a pair of this season’s crop circles, which I’ll share in a later Byte. After Malta came Zurich, where I spoke for the UFOrum group led by Philip Steinauer. Last was Oslo, where Terje (pronounced “Terry”) Toftenes hosted and filmed my lecture for distribution in English-speaking countries. This should be available to anyone who wants to see it within two or three weeks. I will confirm when it’s available in a later Byte. Terje also filmed a two-hour interview with me that he plans to make available as a DVD within a matter of weeks.. While I was in Oslo, Terje arranged for me to attend a lecture by Dr. Masaru Emoto, famous for his book “The Hidden Messages in Water.” I’ve been fascinated by Dr. Emoto’s work since he shot to worldwide fame in the documentary film, What The Bleep Do We Really Know? I was able to meet Dr. Emoto privately to show him many slides in my Starchild presentation. He then offered to put vials of water on photos of the human skull and the Starchild Skull to see what kind of ice crystals they might produce. To me this sounds like a fascinating diversion, so I will contact Dr. Emoto about it at the end of his current lecture tour. Unfortunately, no investor appeared on the horizon in Europe, but a few things are percolating in that direction. The big news, though, is that our geneticist has arranged to use a new piece of DNA recovery equipment to undertake a fresh run with the Starchild’s DNA. This should provide vastly more chains of base pairs, in the hundreds of thousands, and will give a much clearer picture of what we’re dealing with. It should also provide the kind of “can’t deny it” proof that investors and mainstream media require to take our claims seriously. So, personally, I am VERY excited to have this test upcoming, and its result should be available by Christmas to make a wonderful present for us all. This is the plan at this moment, and I will notify you all as it develops. I’m sure everyone was saddened to hear that Zecharia Sitchin diedon the morning of October 9th, and was buried the next day. This news was especially meaningful to me because I knew Zecharia well. I was a member of the first three of his fifteen or so trips taking interested fans around the world to see and experience the places he would write about in his books. And then today I suddenly realized that I was speaking on the stage in Malta at the same time he was being buried in New York. I’m still trying to cope with the feelings that generates in me. When I heard the news my first reaction was to recall my initial meeting with him, in the airport in Miami on our way to Egypt. This was 18 or 19 or 20 years ago, around 1991 or 1992. I’m no longer sure. However, I am certain of my first impressions of him. Short and squat, apparently powerfully built in his youth (he was in his early 70s when I met him and his wife Rina there in Miami). Very soft spoken, and slow speaking, in a strong Russian accent. The rear of his head was rather flat, like the Starchild Skull I would meet 7 or 8 years later, though he was surely as human as anyone reading these words. Just an unusual coincidence that sprung to mind as I thought about him today…..
Another thing I remember was how he would read. He moved slowly and deliberately in everything he did, except when he wanted to examine something, or read. He would snap his thick glasses up to the top of his head and pull the object of his attention close to his face so he could scrutinize it with sharp, focused intensity. Anyone who knew him would recognize that gesture, which epitomized why he was who and what he was. He went after what puzzled or intrigued him the way sharks hunt. He had a zeal for learning that was unquenchable. My most memorable personal interaction with him taught me a wonderful lesson that scientists would do well to emulate. I have dealt with enough scientists now to know they are, with a few outstanding exceptions, men and women terrified at the prospect of ever being caught wrong at anything. But “wrong” is what science is fundamentally all about. Progress in science is nothing but one long series of corrected mistakes. They are wrong at an astonishing rate, so they do everything they can to pretend it never happens, desperately trying to balance a cosmic scale that can never be tipped in their favor. He turned to me, smiled broadly, and gestured with a nod of respectful agreement. “I stand corrected.” That is exactly how it happened, and what it showed was what made him so great. He wasn’t afraid of not being perfect. He just wanted to KNOW, and I had taught him something that he once knew but which somehow had slipped his mind. So now I had re-taught him his own bit of knowledge, and he seemed, and no doubt was, genuinely grateful to have it back where it belonged. “I stand corrected.” THAT is what makes a great scientist, and a great person—the self-assurance and confidence to accept a correction as a natural part of moving forward. Zecharia Sitchin was an icon in the world of alternative knowledge, a man who single-handedly created an astounding body of original research that has stood, and will continue to stand, the test of time. And in the future he will be vastly more lauded than he is now. As with so many original geniuses, he did not live long enough to see wide acceptance of his work, but in the fullness of time he will be recognized worldwide for his academic accomplishments. Erich Von Daniken will be remembered as the person who in 1967 started all of us on the road to the real truth about our origins. In 1976, however, with the publication of “The 12th Planet,” Zecharia pointed us onto a much more direct path to the Truth with a capital “T,” and for that he will ultimately be revered. If there is ever a posthumous Nobel Prize, he will have earned one. I have just learned of the passing of a great man, Lloyd Pye shown here with the Starchild skull. The author and paranormal researcher died December 9, 2013, at the age of 67 after a battle with cancer. Image Credit: YouTube. He was best known for his extensive research and promotion of the Starchild skull, an abnormally shaped human-like skull that he believed was evidence of the hybridization of humans with an advanced extraterrestrial race. He was the author of several books including the novels That Prosser Kid and Mismatch. 2012 – Myth, Magic or Madness? I’ll right away seize your rss feed as I can’t in finding your email subscription link or e-newsletter service. Do you have any? Please allow me recognize in order that I may justt subscribe. For starters, he is wrong when he calls Neanderthals “early hominids”. Neanderthals are actually our “sister species”, they coexisted with modern humans for a long time and went extinct only thousands of years ago. Previous post: 2012 – Myth, Magic or Madness?